Possibly the most salient feature of Inglenook Sidings - the classic British shunting puzzle par excellence - is its sheer simplicity in terms of track layout. There may in fact be some modellers who never really look into this shunting puzzle because it may at first sight hardly seem to offer much operational challenge. But as is so often the case, first impressions can be misleading, and it is precisely the simplicity of the "Inglenook formula" which makes it work so well and makes operating it so highly addictive. The brainchild of Alan Wright (1928 - 2005) is one of those rare examples where a clever and well balanced combination of a reduced setting and input actually provides an unexpectedly rich end result, and Inglenook Sidings is a picture book perfect example of "reduce to the max". Many otherwise reliable sources - such as Cyril J. Freezer in his Model Railway Manual (first published in 1994, several reprints since) - link Inglenook Sidings to A.R. Walkley's 1926 suitcase layout - an origin which is "attributed" and, in fact, wrong. 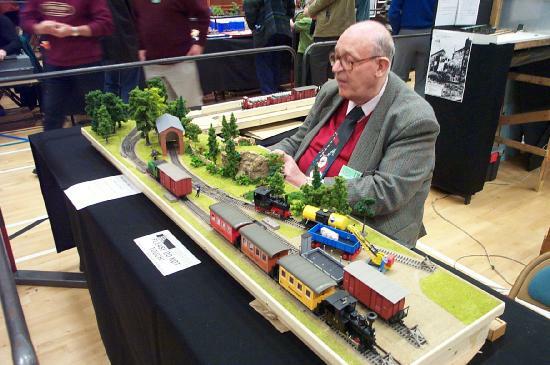 Although the track layouts share certain similarities, Alan Wright - inventor of the Inglenook Sidings shunting puzzle as we know it - pointed out to me in a personal communication in 2001 that he had never heard of Walkley or his work when he built his first small railway, the Wright Lines, in the early 1950s. It was on this small layout (consisiting of a "dented" oval and two sidings) that Wright first had the idea of using a five wagon train on the main line and three wagons in the sidings. The Wright Lines layout was developed over a couple of years, was described and illustrated in the Railway Modeller in 1958, and made a couple of appearances at exhibitions in the North of England. "In December 1979, with the Manchester show approaching, my colleagues at work asked what I would be showing that year and when I said "nothing" I was taken to task and the next day one produced a blockboard off cut 4'0" by 1'0" and challenged me to build a railway on it and show it. Having some odd pieces of track and a couple of points Inglenook was born and the 5/3/3 formula was adopted. It was a roaring success at the show, I had the small controller on a six feet long lead and stood among the crowd listening to what they had to say and then carried out the movements they wished would happen.. The aura of magic such operation produced made the crowd wonder if it was worked by someone watching on television or was it a computer?" Alan Wright won an award with the model that year and later went on to build several layout variations on the Inglenook Sidings scheme. The inspiration for the basic scheme came from an actual location, Kilham Sidings, on the Alnwick-Cornhill branch (Coldstream branch) of the North Eastern Railway NER. In its original form, the 5/3/3 formula was therefore worked on the main line and two sidings (as per the Wright Lines layout). 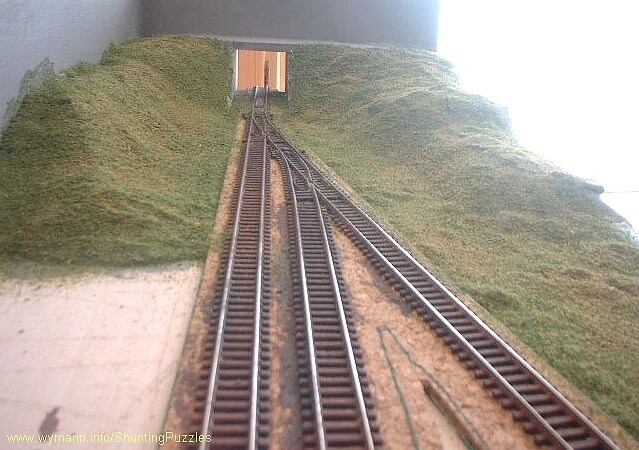 On the minimum space Inglenook Sidings layout this then turned into a stub line ending in three sidings. An illustrated article on the second Inglenook Sidings layout (basically a mirrored trackplan with the headshunt going off to the right, whereas the headshunt on the 'original' 1979 layout went off to the left) appeared in the December 1992 Railway Modeller ("Inglenook revisited", unfortunately out of print). Written by himself, Wright offered additional insight on his little shunting puzzle, including the origin of its name: "The layout of 1979 (...) was named from the fact that it occupied the space beside the chimney breast, the inglenook." Incidentally, the 1992 Inglenook returned to the concept of having two sidings and a mainline, introducing an additional operational complication by having one of the 8 items of rolling stock be a brake van which "can never be moved off the main line". 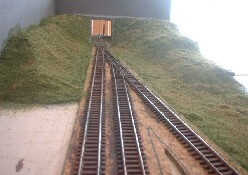 A couple of pictures of the 1979 layout appeared in C.J. Freezer's Model Railway Manual (first published in 1994, several reprints since) and in the December 1984 issue of Scale Model Trains. Alan Wright also recounted the Inglenook story "so far" in the May/June 1999 issue (#22) of Model Trains International. Alan Wright's Inglenook Sidings is still considered to be one possible approach to "perfect railway modelling", and quite rightly so. In this ad, a picture from the second version (left-branching) layout takes center stage. Apparently, the 1979 Inglenook Sidings layout still exists today; when Alan Wright passed away in January 2005 his widow entrusted the original layout to one of her husband's longtime fellow railway modellers.